In this module, Dr. Larry Thompson, Stanford University, and Irene Rivera-Valverde, family caregiver, discuss why taking care of your own health is very important as a caregiver. Heather McKay, dementia care specialist and Teepa Snow, dementia care and education specialist, also give comments and tips for healthy habits for caregivers. When caring for someone with difficult conditions, such as those with dementia, you may become concerned about what you can do to maintain your own health as well. Being a caregiver, you've got plenty of demands on your plate as it is. But taking care of yourself shouldn't have to come last. Certain changes in lifestyle (what we like to call "Healthy Habits") may help you stay strong physically and sharp mentally. 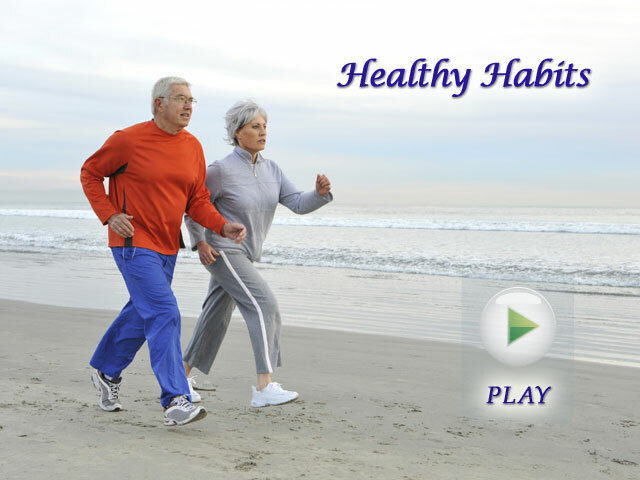 Those habits are: Eating Right, Being Active Physically, Socially, and Mentally. If you take care of your body, your brain directly benefits. Likewise, the more healthy your body and brain are, the better you feel emotionally and physically. ---- Adobe Flash Player 10 is needed to watch this video (get Flash Player). Please wait for video to start streaming. If video does not play well, please reload this page (e.g. press Control+ F5 for Windows, or Cmd + r for Mac). This is an informational site only. It does not provide medical advice, diagnosis, treatment, legal, financial, or other professional services advice.